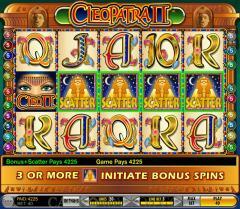 Cleopatra is a very popular theme for online slots. 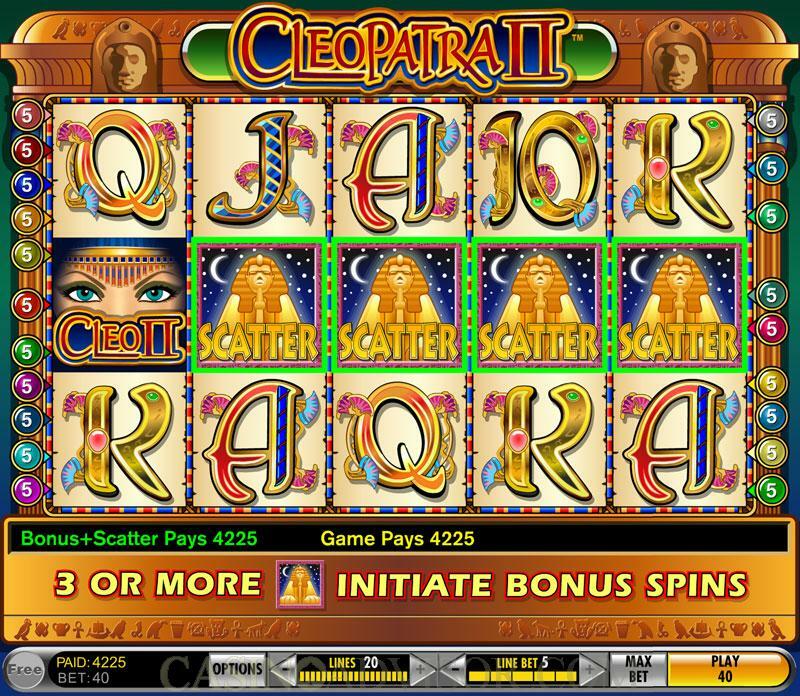 Cleopatra II is an enhanced version of an earlier slot game by Wagerworks. The symbols on the reels exhibit the exquisite finery of ancient Egypt. The Cleo II symbol is the wild symbol and depicts the mesmerizing eyes of the legendary Queen. Several symbols are taken from ancient Egyptian mythology such as the Anubis, Horus and Bastet. The high value card symbols from 10 to A have also been crafted with ancient Egyptian styling. The Sphinx presented against the night sky is the scatter symbol. Cleopatra II allows players to set the graphics quality at four levels. If the player’s system can support the Best level, the player should use this because it has the sharpest graphics. The background music is suitable to the theme with the strains of chanting adding to the realism. The music during wins is appropriately peppier. Unfortunately Cleopatra II lacks in animations. Most of the symbols do not exhibit animations when in winning combinations. Cleo II has the word Double come across it to indicate that it is doubling the payout. The Sphinx symbol has the word Scatter come across it to indicate that it is a scatter symbol. Cleopatra II is a 20 payline slot game. The number of lines can be selected using the indicators below the reels. Players can wager up to five coins per payline and these can also be selected using the indicators below the reels. The coin denomination remains fixed at 1.00. Cleopatra II is a volatile slot game. Five Cleo II symbols in an enabled payline pay out 10,000 coins. This is great for a fixed jackpot. However the other jackpot payouts are considerably lower. Five of some of the other symbols pay out 500 coins at best. As a result players occasionally win large amounts and often win miniscule ones. The maximum payout from a single bet is capped at 250,000. The free spins bonus round also has the potential to offer huge payouts. This round is triggered when three or more Sphinx symbols appear anywhere on the reels. Three Sphinx symbols offer a scatter payout of three times the total bet and between 5 and 15 free spins. Four Sphinx symbols offer a scatter payout of ten times the total bet and between 8 and 18 free spins. Five Sphinx symbols offer a scatter payout of 200 times the total bet and between 10 and 20 free spins. When this round is triggered the player is offered three royal boxes and has to choose one of them. 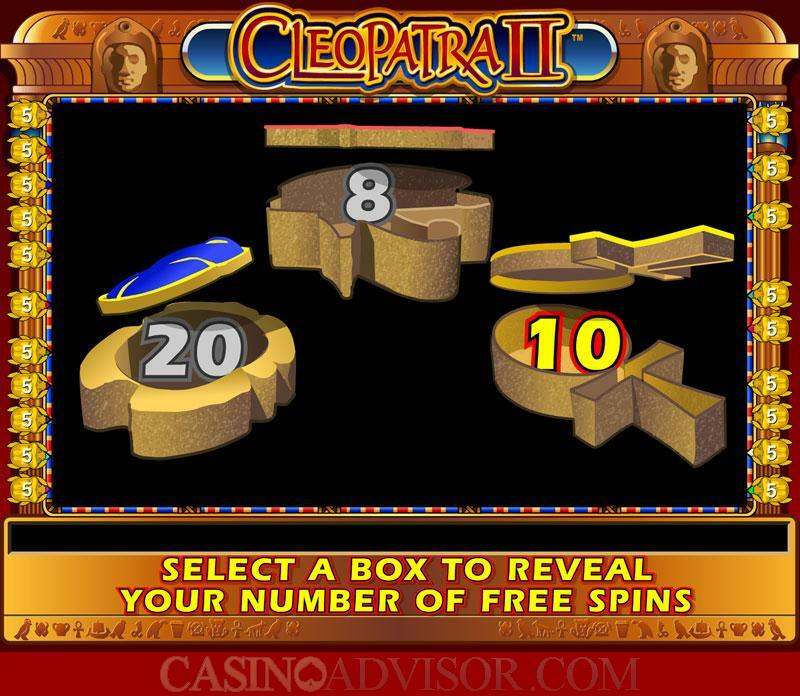 This box then reveals the number of free spins that he initially gets. The free spins can be retriggered but cannot exceed a total of 50. The first free spin is at a multiplier of 1x. Thereafter the multiplier increases by 1 for each spin. If a player is able to win 50 spins then his last spin will be at the multiplier of 50x. The free spins are played with a different set of reels. The reels are richer in the wild and scatter symbols and also have a more liberal payout table. Interested in reading more detailed information about Cleopatra II? If so Click Here for more details.